1986. By the mid-80s Genesis had become a company, a machine worth millions churning out things. Three years earlier they had landed themselves a world-wide hit with their hard-to-get into but unique song Mama; That's All was their entry to the US Top 10. Soon after Phil would have his first of many #1 hits in the U.S. , his next album No Jacket Required turned out a mega-seller and Collins was awarded three Grammies. Mike Rutherford became a world-wide success out of nothing with his Mechanics project, and Tony Banks dove deeper into his faible for soundtracks. In the years preceding these events Genesis had left their mark on the 1980s in various ways. The drum sound Phil Collins used for Peter Gabriel's album III (Melt) was refined on solo and band releases to come. 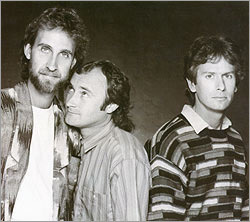 Genesis also discovered the drum computer and, on their album Genesis they worked with drum pads. It was not Genesis who adapted to the 80s, it was the 80s adopting some of the things Genesis produced. Zeitgeist was something they would show on another area later with Invisible Touch and the lengths to which they went to promote their potential for entertainment (particularly with music videos). Their producer was Hugh Padgham again. Genesis had worked with him since Abacab. His predilection for crashing sound made Genesis's change of style the more poignant. His big advantage was that he could simply wait and see what happened. Genesis met, sat down in the studio and began to improvise. There was no leaden big-headed concept the music had to fit into, there was no art they had to follow and no coercion by the record company. In 1985/86 Genesis were for the first time in many years exactly what they always wanted to be – a hobby band who did whatever they chose to do. Genesis had developed a chemistry in the band that was pure because of the solo careers, a chemistry that had to happen in an empty test tube because Genesis came with no material prepared. This mixture made for a balance of powers in the band, as it were, and it gave them all more space to breathe. It also meant that the peculiar elements and strange songs grew rarer or had to develop in the jam sessions. LPs were the dominant format, but CDs were slowly entering the home hi-fi systems. A peculiar „ADD“ on the back indicated that the album had been recorded on an analogue system but had been mixed and produced digitally. Today everybody knows that digital is not always good, but back then it was the non-plus-ultra. The cover fits well in the list of non-inspiring cover art from Abacab onwards, but it does what it is supposed to do. It is striking and catches the eye. The lettering in Franklin Gothic Bold Italics does not. For the first time the caption „Genesis“ was not presented as a piece of art – while the writing on the Mama album is also based on a font it does at least look like there had been an artistic idea behind it. There are a mere eight songs on the album – average for a Genesis album, though there had not been as few songs on an album since A Trick Of The Tail. Tonight^3, as it is known amongst fans since the advent of the internet, placates those fans for whom the title song was simply too much. This one became a world-wide hit, too, but only in an extremely cut-down version. Only the album version with its almost nine minutes brings out the full strength of this song. The instrumental bridge is not quite a revelation but the typical result of a modern Genesis jam session. The lyrics are about drug abuse – Genesis stay in the real world. The song's finale is stirring, and it is hard to comprehend why this song was played completely only on the Invisible Touch tour. Genesis write a protest song! In earlier years they approached this genre in an altogether more oblique way (e.g. Blood On The Rooftops), but 1986 is the time to be direct. Land Of Confusion underlines the band's talent to produce the perfect pop rock song. It is powerful, catchy, spot on and consistent. Genesis hit a nerve with that song, and the Spitting Image video, which to this day is counted among Genesis' better videos and brought them their only Grammy, did not hurt either. As simple as it is, Land Of Confusion is done extremely well and certainly a higlight on the album. Another world-wide hit and another song many fans abhor. In Too Deep was always despised as a Phil Collins ballad, particularly by music critics, but the core of the song is by Tony Banks. It works well as a ballad, but one wonders what makes this song different from others in that vein? The single was still interesting for the fans – it was backed with the non-album track Do The Neurotic, a seven minute instrumental. This song was written to be a hit. Somewhat peculiar sound suggest the presence of a brass ensemble, but it is only the Tony Banks Horn Sections, i.e. samples. Anything She Does is a hip pop number with a hectic, pounding chorus. Once more the focus is on fun – Benny Hill himself played the main role in the video. It has been said that it was a strategic decision not to release Anything She Does as a single because the record company felt it was too close to Phil Collins's solo sound. A two-part epic about a fictitious crisis in Beirut. It was years later that Tony Banks revealed that this song was about politics. Domino excels as a long song and is without a doubt one of the strongest songs in the Genesis repertoire. The first part, In The Glow Of The Night, slowly builds a tension that is interrupted by hectic instrumentation on the verses. It might work on its own and it would have been exciting to test this fragment as a single. Genesis bring out their fondness for progressive elements, though it is all wrapped in an accessible pop sound and a simple structure. The second part, The Last Domino, counters the first half and becomes the driving force. The studio version does not fulfill its potential; the live version is far superior and has therefore been in Genesis' live set since 1986. Domino is one of the songs that illustrate the difference between Genesis and its singer's solo activities. It is a huge favourite with all fans. A blues/soul lovesong about the end of a relationship. Basically a harmless number it did not only turn out another big hit, but a song that guaranteed a jolly mood in the audience. During the intro Phil would have the audience sing a „sigalayyyyyyy-oh“ that grew longer with each tour. Funnily enough, Chester Thompson named this song when asked about the song he likes to play best. An instrumental is an unusual ending for a so-called mainstream record. The Brazilian is something like the brother of Do The Neurotic, which did not make the album. Weird sounds are sampled and looped while keyboards, guitars and drums are battling it out. The Brazilian worked even better live and is, like Domino, distinctly Genesis. It is almost daring to place it at the end of a hit album, but it is a descendant of Genesis albums finales like Los Endos and Duke's End. Whether it is as good as those is up to the listener. 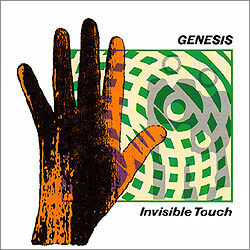 Five pop/rock songs, three progressive songs – Invisible Touch has always been accused of being a pop record. Numerous hit singles outshine what else is on the album. Fact is, it will be the hit singles that will be played on the radio, and it will be the less accessible songs that provide live highlights. Invisible Touch became the album to hate for the progressive purists amongst the fans though Genesis were more at ease as a studio band in the mid-80s than ever before. One need not like the fact that they modernized their soung but it is understandable. One may regret that they had ceased writing Supper's Readys but that ensured the band's survival. The five US Top Five hits this album brought about was a surprise to both the fans and the band. Genesis cannot and do not want to deny their roots – epics like Tonight, Tonight, Tonight and Domino prove that as well as the instrumental The Brazilian. One could call it proggy pop. All in all the prog elements in a pop outfits may describe things better. Invisible Touch is most of all a very consistent album. Berated as a pop sin, celebrated as a mainstream manifesto – success definitely took away the band's mystical touch. They became understandable, even funny, no longer a gem in the pole position of the record shelves but a mass product for everybody. 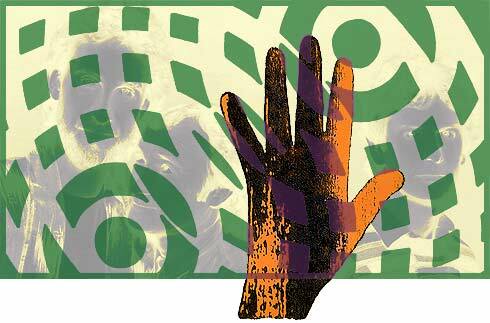 Invisible Touch closed many doors – but for many new fans it paved the way to the band's progressive roots in the 70s. That is probably the album's largest merit.